I’m delighted to host Ben Davis talking about ‘writing funny’ on the blog today. 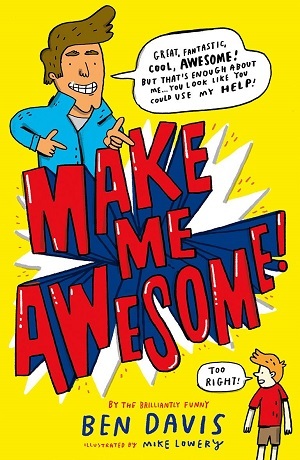 His latest book, Make Me Awesome, has the remarkable capability of not only making the reader fall about laughing, but also being astute and spot on with its portrayal of a teenage boy using grit and optimism to help his down-in-the-dumps Dad. As daft as it is sympathetic, Davis uses modern technology to inspire this self-help story about the importance of friendship, family, and above all, trying! Hello! I’m Ben Davis and I write funny books. Well, they’re supposed to be funny. I wrote The Private Blog of Joe Cowley series, which concluded last year, as well as standalone books for younger readers such as My Embarrassing Dad’s Gone Viral and Make Me Awesome, illustrated by Mike Lowery, which has just come out this month. Make Me Awesome is the story of Freddie, a boy whose family has fallen on hard times. He decides that if no-one else is going to pull them out of their slump, he will have to do it. He signs up to Chuck Willard’s Complete Road to Awesomeness Program – an online guide to success, and tries to apply its sometimes questionable advice to his situation. Anyway, enough plugging. Let’s get down to brass tacks. The reason I’m here is to share with you my top tips for writing funny fiction. Barry Cryer once said that ‘analysing comedy is like dissecting a frog. Nobody laughs and the frog dies.’ Well, that may be true, but I’m going to try anyway. Let’s start slicing some frogs. This is an important one. You can have the best jokes in the world, but if the characters delivering them are one dimensional, no-one’s going to care. When your character has a clearly defined personality and worldview and is put through the ringer, the comedy will follow. The best writing tip I ever received is ‘put your character up a tree and throw rocks at them.’ When I finally realised it wasn’t meant literally, I was set. You see, the best comedy comes when your character is up against it. We laugh at their failures, and as a handy side-effect, root for them to keep going. One of my all-time favourite films is Planes, Trains and Automobiles. It’s about two men, Neal and Del, who are trying to get home for Thanksgiving. They begin as complete strangers but end up joining forces through cancelled flights, broken-down trains and burned-out cars. Del is sweet and affable but massively overbearing with some odd boundary issues. Neal is aloof, brittle and short-tempered. Putting two such wildly different characters together and throwing tons of obstacles in their way results in some of the best comedy ever committed to film. In my opinion, anyway. In Make Me Awesome, Freddie, a well-meaning but slightly misguided boy, is trying his best to become more entrepreneurial and serious, but his every attempt ends in disaster. Like when he puts on a suit of armour and buries himself at an archaeological dig site because he wants to be a famous prankster. Or when he runs for school president and somehow ends up getting caught in the girls’ changing room with a camera. Basically, reading and writing about the misfortunes of others makes yours seem much more bearable. This way of writing comedy was best summarised by the great Mel Brooks when he said ‘Tragedy is when I cut my finger. Comedy is when you fall down an open sewer and die.’ Depressing, but true. As lakes were to Wordsworth, embarrassment is to me. It’s my muse. My inspiration. All of my books are built around it. I have an incredible memory for embarrassment. I couldn’t tell you what I had for lunch yesterday but I can remember an embarrassing thing that happened to me in Year Seven in crystal clear HD. Writing cringe humour is like tightrope-walking. Too mild and it flops. Too extreme and the reader might want to burn the book on a massive bonfire. My Joe Cowley books are filled with moments like this. Joe’s habit of speaking before engaging his brain gets him into all kinds of toe-curling scrapes. The wider point to be made here is write what makes you laugh. It might not be cringe humour for you, it might be surreal comedy or observational or anything, but if you like it, chances are someone else will, too. Everyone has a funny story or two up their sleeve, and with enough tweaking, it can become great fiction. The key is to take only the best bits and embellish the rest. I’ll give you an example. When I was about thirteen, I was referred to a dental specialist because one of my teeth wasn’t growing down properly. He put one of those plastic stretcher things in my mouth that made me look like Wallace and snapped a few polaroids, which was awkward enough. Then he brought in a few dental students and they all leaned close and had a good gawp. For a mortally self conscious teenager like me, this was no fun at all. Years later, I knew I had to use this for something, and by the time it made it into Joe Cowley: Return of the Geek, it had become an epic tale where Joe’s girlfriend Natalie gets her lip piercing stuck in Joe’s brace and they have to be freed by a dentist while being stared at by a load of dental students. Of course, the whole thing is a wild exaggeration, with just a kernel of truth in it, but it shows how you should never be short of inspiration when writing the funnies. So that’s it from me. I hope some of this has proved useful to you, and if you do put any of my tips into practice and get a book deal out of it, all I ask is an acknowledgement and 75% of the profits. With thanks to Ben Davis. If you want to buy Make Me Awesome, and see how comedy’s done, click here.